Protect the right to manage energy usage without discrimination! In a state with so much sun, rooftop solar should be a no brainer. But the Kansas Corporation Commission together with Westar and KCP&L killed the residential rooftop solar industry by changing electricity rates for solar homeowners. Good solar jobs are disappearing overnight, along with homeowners chance to save on their energy bills. The good news is that Kansas lawmakers will be considering a bill to grow the rooftop solar industry. SB 124 and HB 2190; the Energy Fairness Act protects Kansans and their right to manage their energy usage in order to lower bills without penalty or discrimination. The Act allows no extra charges for investor owned utility customers who generate some of their own power. Link to Save Kansas Solar Webpage. We need your support for The Energy Fairness Act! Here are ways to take action right away. Share why you support energy fairness in Kansas! Click below to share a testimony that will be delivered to the Senate Utilities Committee. I support the Kansas Energy Fairness Act! 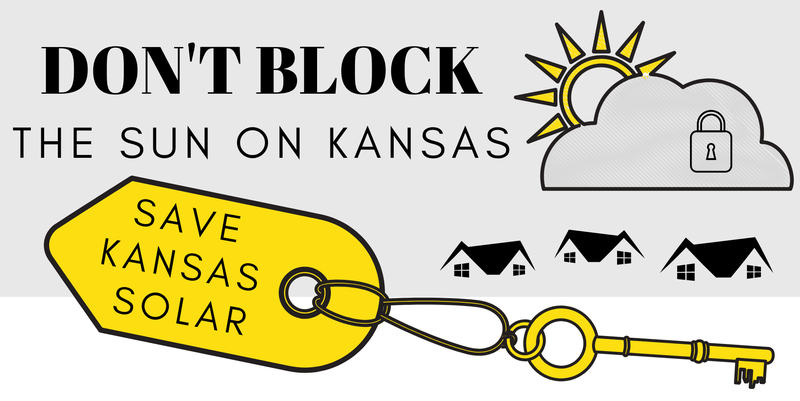 Share the Save Kansas Solar webpage on social media page and ask others to share their support for the bill. Stay tuned for a committee hearing at the Statehouse!